Technically I went five from five for Round 2 – if you’ll allow me the second of my alternate picks for last Friday’s Kangaroos vs Giants game. I thought the Kangas would be the safer bet in one contest, but in the other I was more intent on saying the Giants would cover. You can point out that I thought the Giants would push them harder than they did, that while I left in the possibility of a Carlton resurgence at some point in the future, I didn’t think it was coming Sunday, and that it turned out to be a pretty form-filled weekend that anyone could have picked well. In which case – yeah, big fat deal. 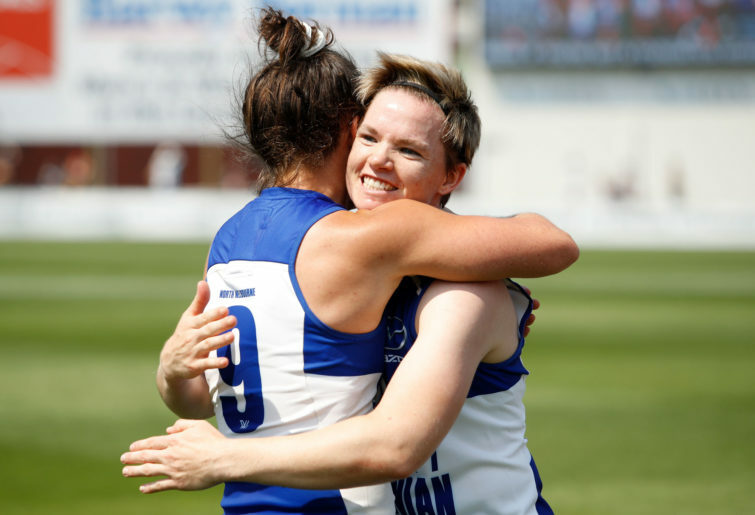 So, with the BAFTAs and Grammys filling the screens this week, let’s present the awards for Round 2 of AFLW Season 3: The Year it Became Footy. The improved play across the league for the (mostly male) fans who denigrated the competition’s first seasons of play as too inferior to the men’s game to merit their support, but supported it anyway in the hope of improvement. That improvement in the first two rounds has been too blatant to ignore, even by the league’s worst detractors. 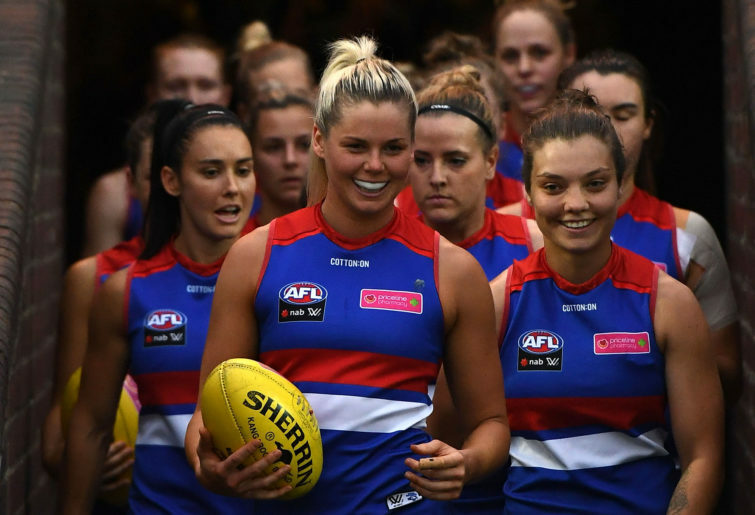 The anecdotal evidence is strong – games are no longer long strings of ball-ups after ten women have scrummed over two-meter kicks. 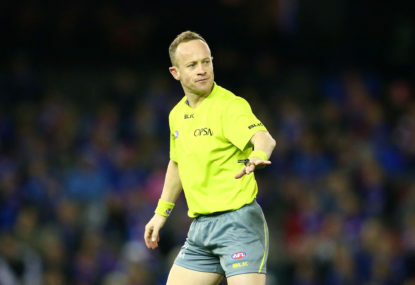 Instead we see plays like the mid-Q3 set of four long kicks in the Adelaide game on Sunday where the Crows started a string out of their own goal square that ended in a running goal by former defender Stevie-Lee Thompson. And scoring is up significantly. Last year’s Round 2 average score for each team was 30.37; this season it’s 36.40 per team, a 20 per cent increase. Stretch the games out to the men’s game length – 20 minutes instead of 15 minutes per quarter – and they’d be scoring at a 61-point-per-game pace. That’s not quite the 104.5 points the Melbourne men averaged last year, true, or even the men’s league average of 83, but it’s better than the Gold Coast men’s 59.5 points per game and just about what the Blues men averaged (61.5). Just as the scoring improved as the seasons have gone along, we can expect something akin to that this season as the skills continue to improve and the teamwork gels among women who’ve barely played a month as teammates in many cases. The undefeated Dockers are not only one of three teams sporting a 2-0 record, they also have the most impressive pair of pelts in Melbourne and Brisbane. Last year it took them five rounds to score 135 points; in just these first two games they’ve already hit 126, far and away the highest total in the league at this point. (The Kangas are next at 100.) Fremantle average 9.5 goals per game – half the teams in the league are yet to score that many in two games. The offensive thrust resembles a fast break basketball team more than a women’s footy squad, and yet they’ve not completely abandoned defence to accomplish what they’ve done so far. While their opponents have scored more than is typical, their attitude is not unlike that of a good fast break court team – you can score quickly so we can get the ball back and score twice more. 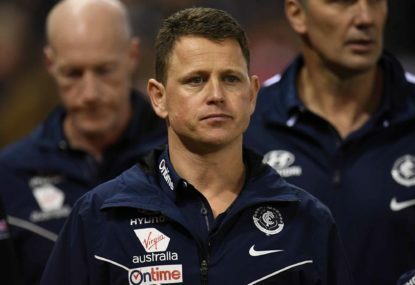 It isn’t hard at all to imagine a 5-1 Dockers team facing a similarly placed North Melbourne squad in Round 7 for all the Conference A marbles – and the game would be at Fremantle Oval. If that happens, the purple wave may not have to leave Western Australia for three weeks straight. Taking the prize from the NBA, which had a Western Conference on one side and LeBron James on the other for years, is this new award for the folks at AFLW headquarters behind Conference A, as evidenced by this group’s five victories over B this weekend by a nice round total of 100 points. 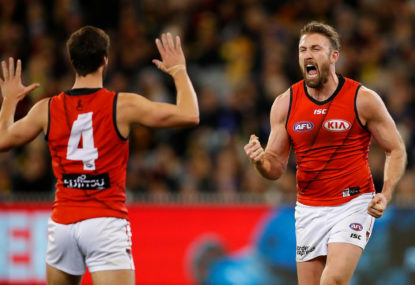 As Troy Wheatley of The Wooden Finger points out, if last place in A (Melbourne) wins against first place in B (Brisbane) on Sunday – and Melbourne’s percentage is an astounding 45 per cent higher – “then the comments that the sixth and seventh ‘best’ teams could get into the finals may gain even more momentum”. If you look at the goal-kicking leaders here at the 30 per cent mark of the season, Brisbane’s Jess Wuetschner has the lead with five – and I know she’s good because I just discovered that I can now spell her name correctly without looking it up in advance – followed by three great players at four. One’s Ashley Sharp of Fremantle – part of that purple onslaught we just discussed, with four top-ten goal scorers right now – and the second is superstar Emma King, who’s transferred to North after two great seasons as a Magpie. The third is a young woman who had never scored a goal before Sunday, when she was moved forward by new Adelaide coach Matthew Clarke from her traditional position in defence. 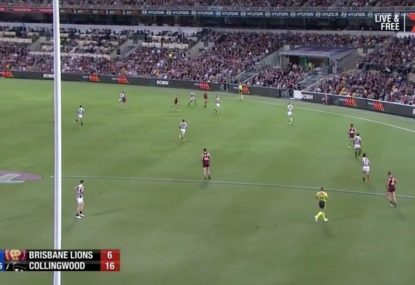 Stevie-Lee Thompson was apparently wearing an invisibility cloak at times out there that prevented Carlton players from finding her in the forward 50 – but not, obviously, the Crows midfielders who were sending the ball inwards. Thompson kicked four goals straight and almost single-handedly brought Adelaide back from that 17-point deficit to a 13-point win. Erin Phillips was also key, but we’ve come to expect that of the super-Crow. Every time she touched the ball, she nailed her shot between the big posts as if she’d been doing it her entire life. I was a maths and music teacher for the first 30 years of my career, so when I hear bad mathematics I just start to cringe. It may not have bothered anyone else, but to Sarah Jones, Sharni Layton and Leigh Montagna can I just say, “Please think before you speak”. As the fourth quarter of the Adelaide vs Carlton game wound down, with the Crows holding a 57-44 lead – note: a 13-point lead! 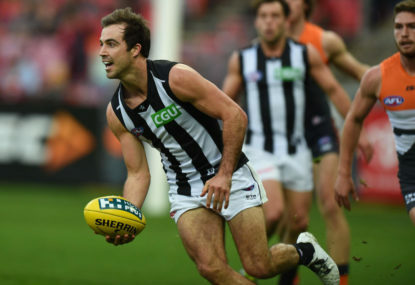 – the three Fox Footy crew members kept emphasising that the Blues needed to kick two goals in the last three minutes. Soon it was two goals in two minutes. The problem of course is that this wouldn’t be enough to catch them Crows, only to come within a point. But maybe that’s because goals are not always six-pointers. As the clock wound down to 75 seconds, Jones suggested that Ebony Marinoff, attempting a set-shot, was “backing herself in from 50 (metres) to turn a 13-point lead into a 16-point lead”. On the other hand, the same broadcast started with some of the superb inside-the-lines coverage that we often miss in the men’s game: Carlton coach Daniel Harford’s final pep talk to his team before they took the field for their home opener at iconic Ikon Park. “The notes have been written on the sheet. The score’s in front of us – the music score’s in front of us, and we’ve got our instruments in hand. All we need to do is play the notes in front of us. “The teammates around you will do the same thing, we back them to do it so the harmony is perfect, the music is perfect, and we make the best concert we can. I don’t know Harford at all. I don’t know if he’s ever played in a band or an orchestra, but his analogy is perfect. I conducted band concerts for all of those 30 years and I could just about have given that exact same speech before every performance I directed. Bravo, coach. After the first round our meta-player of the year tallies had 18-year-old Rising Star nominee Nina Morrison of Geelong as the leader up to that point, with a significant gap back to Emma King and Jasmine Garner of the Kangaroos. Even without playing this weekend in her team’s rout of the Giants she’ll continue to lead. It’s the tragedy of our sport and many like it – we can’t bubble-wrap the athletes or we risk hiding those very skills we value in them. For some – Kiara Bowers of the Dockers comes to mind, as does Alex Johnson at Sydney – their battle to return to competition after injury can take years, and they might never make it back to the heights they’d reached before their accident. 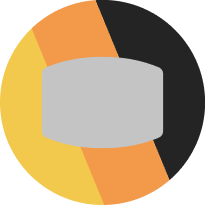 We try to protect the athletes from the aftereffects of concussions – the turf is generally tougher than your unprotected noggin so we’ve legislated as illegal any tackle that makes the clash of brainpan and ground and installed protocols to prevent players from trying to be heroes at the expense of their health. But we can get hurt playing with our kids on the living room floor or slicing a bagel or doing anye one of a million different things. Of course this is the case after a stellar Round 2 last week. As they say in the stock market game, past performance doesn’t guarantee future results, but I feel good about what the five AFLW games hold for us this upcoming weekend and our ELO-FF picks for the winners. ELO-FF says Roos by 5.8 points in Tasmania, and that seems about right to me. The Western Bulldogs are the best team they’ve played so far, but the Kangaroos have proven they’re the real deal – and the home crowd will get them that one extra goal. Possibly the two best teams in the league on a Friday! ELO-FF says by 19.8 points. Carlton looked better than the final score indicated last week, but on the road? I think the Giants will be too much for them. I’m taking the points, though. ELO-FF says Freo by 9.3 points, and I agree. Are you really going to bet against Fremantle at home right now, especially against a 0-2 team with just 32 points to its name so far? ELO-FF says Adelaide by 7.8 points. At home the Crows have too many weapons for Geelong, especially if Thompson’s discovered a hidden penchant for goal-kicking and Phillips is roaming free. Once again Brisbane’s the closest favourite of the weekend’s five games. ELO-FF has them winning by just 3.1 points. But despite the loss in Freo last week, they still look to be the class of their conference, and Melbourne misses Daisy Pearce’s leadership. Besides, Melbourne lost to Fremantle too. Last week: 4-0-1. Overall: 8-1-1. THe competition not looks like top-notch professional football. During the first two years games too often resembled the under-16s tussles of crowds of bodies constantly crumbing after loose balls. Now the AFLW’s closest cousin in product is arguably the state league men or maybe the interstate all-star under-18s matches. Even the most vehement defenders of women’s footy would admit the difference in athletic explosiveness – if there’s a Jeremy McGovern or Isaac Heeney-like mark in the near future, I’ll eat my non-existent hat – but like the growth of women’s basketball, the AFLW is quickly becoming a distinct sport of its own, equally competitive and entertaining in its own right. I’d love to say that this is going to be the roster-picking of the North Melbourne Tasmanian Kangaroos start-up operation if they make the grand final in their first season rather than the inherent worth of the league itself. That’d be nice. Bruce McAvaney loved it as former number one draft pick Cam Rayner finished off a great effort. 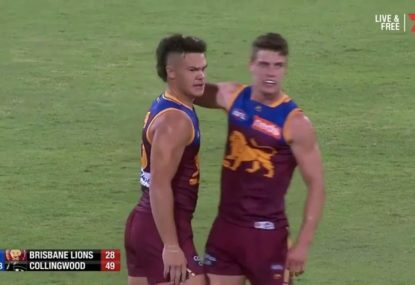 Brisbane fans would put the umpire down on the scorer’s list you’d reckon!